For too long, all-flash arrays seemed a distant contender in the data center storage wars. High costs and uncertainty kept businesses from adopting. However, the landscape is changing, and the benefits of all-flash arrays far outweigh their mythic risks. As costs have come down, the increasing use of all-flash arrays – the modules of which makes up a solid state disk (SSD) – provides agility, speed, and analytics to business. In fact, a recent TechTarget survey found 37% of enterprise respondents are planning on investing in server-side flash installations for the data center. While numerous, the big benefits of all-flash arrays for the data center can be organized under four categories: speed, costs, analytics, and scalability. IT leaders looking to help boost the business from an infrastructure standpoint should consider all-flash arrays as a source strategy, covering some of the most critical functions of IT. Unlike traditional HDDs, flash arrays have no moving parts or physical seek limits, which equals high IOPs (Input/Output Per Second). One of the biggest benefits of all-flash arrays is increased read-write and access speeds. The best performing storage tiers often use only all-flash arrays, providing that key edge in data access and processing. What does that mean for storage users? Well, for one thing, all-flash arrays enable incredible data-mobility speeds. Sharing, accessing, and moving data across functions is simpler and quicker. Better access to internal users improves ROI across every aspect of the business, which also enables IT staff to focus on more strategic initiatives. Faster is just better. That doesn’t necessarily mean it’s always the right fit for every aspect of your storage infrastructure. If you don’t need speed, then HDDs are a good back-up solution. For a long time, all-flash arrays were simply too costly to use for primary – or, honestly, even secondary – storage in the data center. Since 2010, the cost per gigabyte for HDDs has maintained somewhere between $0.03 and $0.10. For SSDs today, the price hovers between $0.29 and $0.87. That price has dropped significantly since the early 2000s. And experts only expect all-flash array prices to fall closer to HDDs. The return on investment? Speed, reliability, responsiveness, weight, functionality, agility. The reality is that users – both individuals and businesses – are storing more and more in the cloud. With less need for space, these other factors become more valuable in finding a storage solution that gives you an edge. 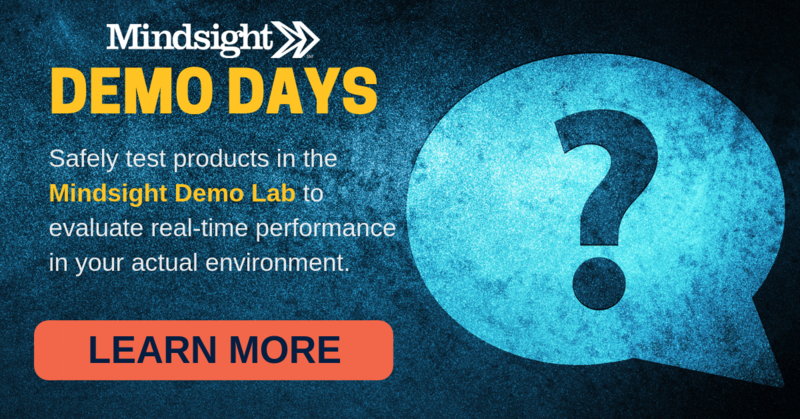 If you’re not sure if all-flash arrays would really work for your environment, sign up for Mindsight’s weekly Demo Days – our (free!) hands-on lab experience where we safely test a solution in your environment – or contact us today. What can you do with increased read-write and access speeds? Lots, it seems. As businesses move into the digital age, the need for real-time analytics is growing exponentially. We mean that literally. The amount of data businesses have access to is exploding, and this in turn leaves leaders with both an obstacle and an opportunity. Data can weigh you down. Or, it can buoy you through turbulent times. All-flash arrays can provide the speed and access needed to use that data to guide your team toward better-informed decisions – data-driven decisions. At a time when the nature of computing and the data center is changing drastically, the biggest benefits of all-flash arrays become obvious. Some are tolling the death bells of on-premise infrastructure, while others, lovingly called “server-huggers”, are hanging on with all their might to a time that may not be for much longer. Wherever you personally might fall, there is no disputing that technology is always changing. People no longer store photos and music on desktops – it’s in the cloud. And businesses are making the same shift. 77% of enterprise businesses are using hybrid cloud models today, and that number is only expected to grow in 2019. All-flash arrays have several features that make them ideal for scenarios where businesses need to be agile and scale – either way – quickly. They’re faster, more resilient (see: no moving parts), non-volatile, and rewriteable. While all-flash arrays offer the best speed and performance, that may not necessarily be what you need. That may not be you. That doesn’t mean you have to rely strictly on slower HDDs. Hybrid flash arrays can provide a best-of-both-worlds scenario. Whether you are ready to invest in a specific storage architecture, or if you want to talk to storage experts and test solutions in your environment, our team is ready to help. As a trusted advisor to businesses across Illinois, we’ve helped a global manufacturing client reclaim terabytes of storage space, and using a flash array, we solved a storage bottleneck for another client. That’s what we do. We help organizations find the right solution that fits their workload, budget, and storage needs. Whatever your next step, Mindsight is here to help. If you are ready to get started, or just a have a few more questions, contact us here.